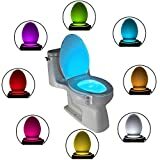 There are all sorts of practical reasons as to why you’d want a light up toilet seat or toilet night light in your bathroom. For one, it’s a fun spin on a boring, everyday task that we all must do. It can also help you toilet train the little ones, by reducing their fear of the toilet. What’s better than a light up toilet seat? 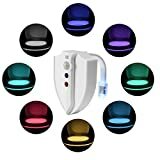 One that will allow you to choose from eight different colors at the flick of a button. That’s right – eight! You can even set the light to change on a rotation or display a solid color. The best thing about this particular light up toilet seat is that it is controlled by motion sensor so it will only turn on when you approach it. This will keep your power costs down and allow you to keep your main lights off at night. The Kohler Cachet Nightlight Lid Set is more than just a toilet bowl light. It also comes with a light on the lid, so it can display the light even when the toilet seat is down. You get a whopping six months of power from the 4 AA batteries that this model requires, so that means less time maintaining the light. The lid features a soft close mechanism so it can’t slam, and the nightlight is light sensitive so only works at night. The J&L LED Motion Activated Light is a smart light toilet seat option. If you’re keeping the overhead lights off at night, how are you to know whether the toilet seat is up or down without feeling around for it? This toilet seat light works by displaying a green light when the seat is down and a red light when it is up, so you won’t have to guess or use your hands anymore. This is a much cleaner option for your night time toilet usage. As far as motion activated nightlights go, the GlowBowl Motion Activated Nightlight is a very standard offering, which makes it perfect for those who just want a light with no fuss. 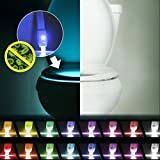 This nightlight will light up the whole toilet bowl with a soft glow, and can rotate through seven different colors. This particular toilet light was featured on Shark Tank, which makes it one of the most publicized toilet lights on the market. 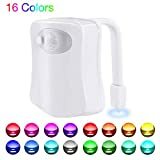 Boasting a completely splash proof design, this light comes with eight color choices and is fully motion activated for your ease. Our personal favourite toilet night light is the Glime LED toilet light for the simple reason that it helps keep your toilet clean. Emitting ultraviolet light, this light can disinfect and sterilize your toilet bowl, killing 99% of the bacteria and mold that can grow in there. Neat, huh? Toilet night lights may not have been on the top of your list of new purchases for your home, but there are many reasons why you should want one. 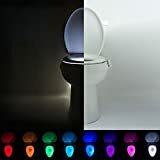 A toilet night light will enable you to make your middle of the night bathroom trips without having to turn on the overhead lights, keeping the rest of your household and your power bill happy! By following our guide, you’ll find the perfect light up toilet seat for your home.